You have 2246 characters. Don’t forget to add important and relevant keywords in your description to improve your iTunes app page and optimize your SEO. Your app's last version was released on November 23, 2017. It is important to regularly update your app. Best practices recommend to update your app every 4 to 6 weeks. This means fixing reported bugs, improving existing features, launching new features etc. Keep an eye on users' feedback. The next great features may already be asked by many users. THIS APP IS NOW REVISED, UPDATED, & EXPANDED. 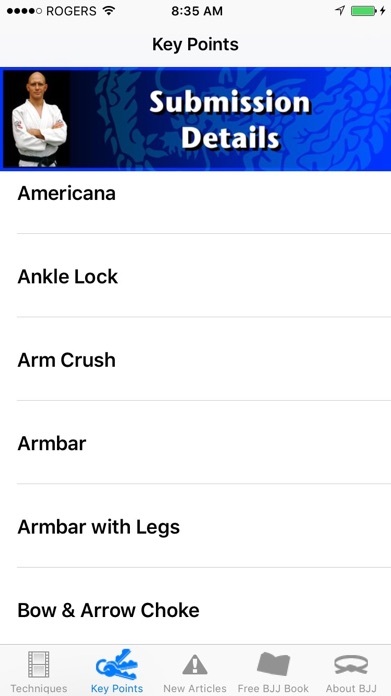 Step-by-step instruction for the highest percentage submissions in Brazilian Jiu-Jitsu and Submission Grappling on your iPhone, iPod Touch or iPad. Stephan Kesting is a Brazilian jiu-jitsu blackbelt, an instructor in Combat Submission Grappling, and has over 30 years of experience in the martial arts. He also operates Grapplearts.com, one of the most respected grappling sites on the web. In this app Stephan takes you through the most effective and highest percentage submission techniques that can tap out any opponent. * Additional 'Details' videos for every technique, taking you through the advanced points to make the submissions truly effective.